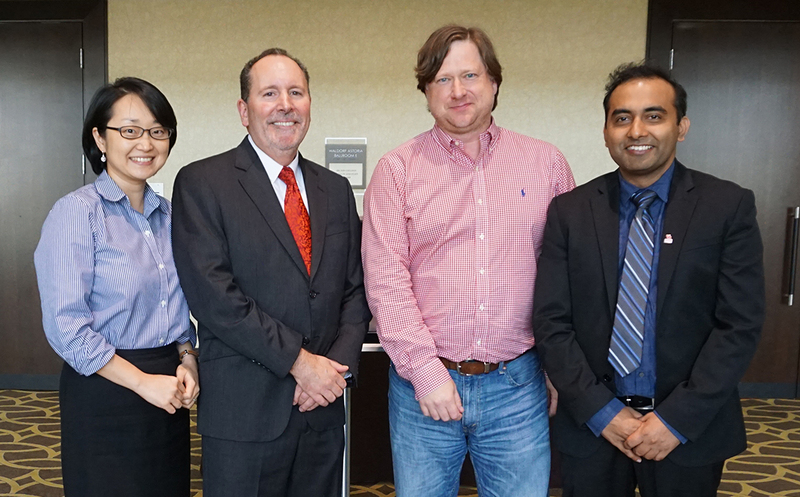 Congratulations to our newest associate professors – Drs. Yoon Koh, Chris Taylor and Priyanko Guchait! Dean Dennis Reynolds announced their promotions and presented each with a bottle of Dom Pérignon to celebrate the end of their long journey to tenure during the third annual Faculty and Staff Awards Luncheon held May 3 in the Hilton University of Houston’s Waldorf-Astoria Ballroom. The tenure process is a rigorous one that takes years of research and publication. We are proud to “raise a glass” to this terrific trio on their well-deserved promotions. Dr. Guchait, known to our students as Dr. G, holds a BE in Mechanical Engineering from the University of Pune in India, but began studying hospitality to pursue his fascination with human psychology. After all, he said, everything about hospitality and service is about people. He earned his first MS in Hotel and Restaurant Management from the University of Missouri, and a concurrent MS in Human Resources and Employment Relations and Ph.D. in Hospitality Management from The Pennsylvania State University. He joined Hilton College in 2012 and, as faculty advisor to Eta Sigma Delta International Hospitality Management Society, he has been instrumental in the growth of this honors organization. His research interests are in organizational behavior, organizational psychology, human resources, error management, service management and leadership. He received the Provost’s Excellence Award in 2015 and the Stephen Rushmore/HVS Faculty Research Award in 2016. Dr. Guchait is also the author of more than 35 peer-reviewed journal articles. He is currently examining error orientation of hospitality employees and how it impacts their attitudes, behaviors and performances, as well as examining how organizational error management practices impact employee emotions and health. Dr. Koh, who worked in the banking and the hospitality industry for five years, joined Hilton College in 2011. Her interest in hospitality stems from her love for traveling and learning new things. She has a BA in English Literature from Ewha Womans University in South Korea, an MTA in Tourism Administration from the George Washington University and a Ph.D. in Business Administration from Temple University. In 2017, Dr. Koh received STR SHARE Impact Award, and is also the recipient of the Certificate of Excellence in 2015, the Stephen Rushmore/HVS Faculty Research Award in 2014, and the University of Houston’s New Faculty Grants and Small Grants programs. This January, she will once again serve as the planning committee co-chair for the annual Graduate Education & Graduate Student Research Conference in Hospitality and Tourism. Dr. Koh’s research centers around financial and performance implications of corporate strategies in the hospitality industry, and lodging industry performance measures. She serves as a guest editor of a special issue "Economic Impact of Corporate Social Responsibilities" for Tourism Economics, and received Best Conference Paper Award for the annual Graduate Education & Graduate Student Research Conference in Hospitality and Tourism in 2017, Outstanding Scientific Paper Reviewer in Finance Award in International Council on Hotel, Restaurant and Institutional Education (ICHRIE) in 2012. She has also penned more than 20 peer-reviewed journal articles, and is currently working on projects that explore the financial consequences of sharing economy and corporate social responsibility. In addition to celebrating her own tenure this month, Dr. Koh is proud to have served as the faculty advisor to Drs. Amanda Belarmino and Yue Teng-Vaughan, newly minted graduates from the first cohort of our Ph.D. program. Dr. Taylor fell in love with food and wine during his junior year in college. He has a BS from Texas Tech University, an MA in Management from Wayland Baptist University and a Ph.D. in Hospitality Administration from Texas Tech University. Before joining Hilton College in 2013 to run and enhance the College’s Beverage Management Program, Dr. Taylor held several administrative positions at Eastern New Mexico’s College of Business, including MBA coordinator, interim dean and dean, was in a fine wine management role with Glazer’s Wholesale and also served 14 years in various management roles within the Office of the Texas Attorney General. His true passion is wine, with research interests in wine preference development and education, consumer behavior and marketing of wine, as well as wine tourism and eco-wine tourism. Dr. Taylor is also the one responsible for creating the Texas Food & Wine Experience, a popular road trip class now offered during spring break. He was recently named director for research for the International Council of Hotel, Restaurant and Institutional Education (ICHRIE).